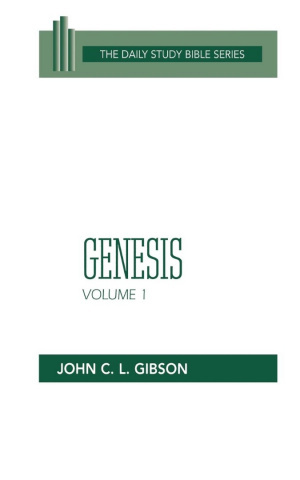 In this first of two volumes on the book of Genesis, John Gibson--Old Testament General Editor of the Daily Study Bible--offers a probing investigation of the first eleven chapters of Genesis. He provides a perceptive verse-by-verse and even word-by-word examination of the well-known Genesis stories of creation, the garden of Eden, Cain and Abel, Noah and the flood, and the Tower of Babel. Carrying forward brilliantly the pattern established by Barclay's New Testament series, the Daily Study Bible has been extended to cover the entire Old Testament as well. Invaluable for individual devotional study, for group discussion, and for classroom use, the Daily Study Bible provides a useful, reliable, and eminently readable way to discover what the Scriptures were saying then and what God is saying today. Genesis : Vol 1 : Daily Study Bible by John C.L. Gibson was published by Westminster in December 1999 and is our 30174th best seller. The ISBN for Genesis : Vol 1 : Daily Study Bible is 9780664245689.